Universal Radio has started a special deal-of-the-week on their home page. They’re featuring the Grundig S450DLX as their first deal. At $88.77 US and including the book, “Discover DXing,” this is an excellent gift idea (indeed, we featured this radio in our 2011 gift guide). [We’re] pleased to report that our new 2012 print catalog should arrive tomorrow night. It is our largest print catalog ever, at 132 pages. 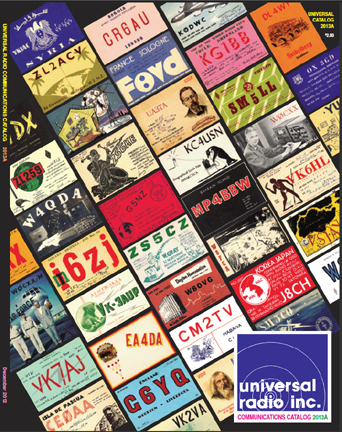 Universal Radio’s catalogs are the only catalogs I keep archives of. They’re great for referencing current production radios and accessories, and later can serve as a resource when researching used prices (another excellent tool is their sold/used item index). Plus, I always love their cover design. This entry was posted in News, Retailers, Shortwave Radio, Specials and tagged Grundig S450DLX, Universal Radio, Universal Radio Catalogs on December 5, 2012 by Thomas. I’m sure they can get one in the mail for you!